I am interested in operating on Amateur Satellites. I started off on the Russian satellite, RS-12 because the equipment and antenna requirement were modest. 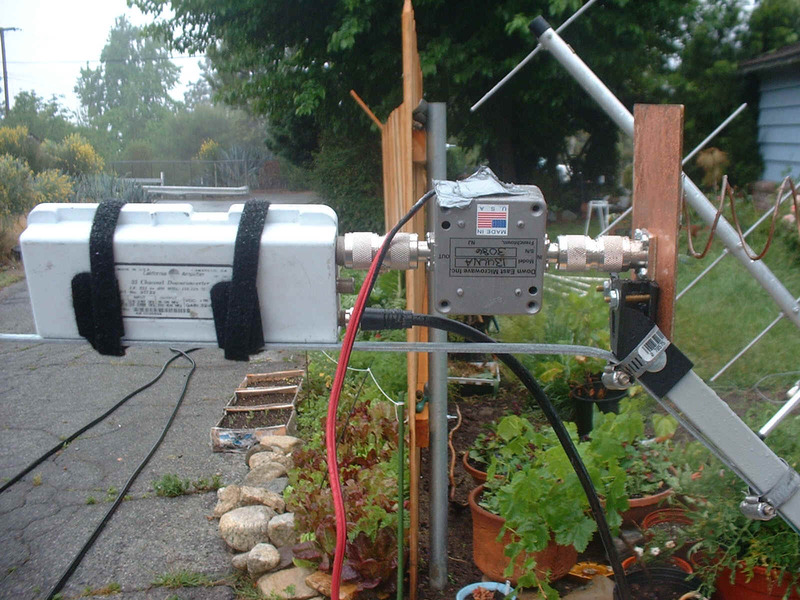 I was reluctant to invest in expensive antenna pointing equipment until I knew if I liked operating satellites. I took a satellite operating class at the ARRL Southwest convention in 2001 where I got interested in working AO-40. AO-40 is a Phase 3 satellite meaning that it is in an elliptical orbit. The satellite frequently "hangs" over a position on the Earth for hours at a time so antennas can be turned by hand as it doesn't move very fast with respect to the earth. Since the satellite uses a transponder, FM modulation is not allowed. I needed radios that had 2M/70cm SSB capabilities. In addition, you must operate satellites using a full duplex system. You need an all mode dual band radio capable of running full duplex (a "satellite" radio) or two separate radios that support 2M and 70cm all mode. My Icom IC-746 HF rig has 2M all mode capacity which took care of the downlink and I had 70cm all mode capability in my Yaesu FT-817. The uplink was not too difficult. I used my Yaesu FT-817 to excite a Mirage D1010 70cm linear amplifier. The 5 Watt drive puts out 70 Watts into a 6 element linearly polarized Yagi I purchased for $35 on E-Bay. My uplink is strong enough at low squint angles to set off LEILA (the over strength uplink signal warning). I frequently need to offpoint the Yagi to keep the signal strength down. 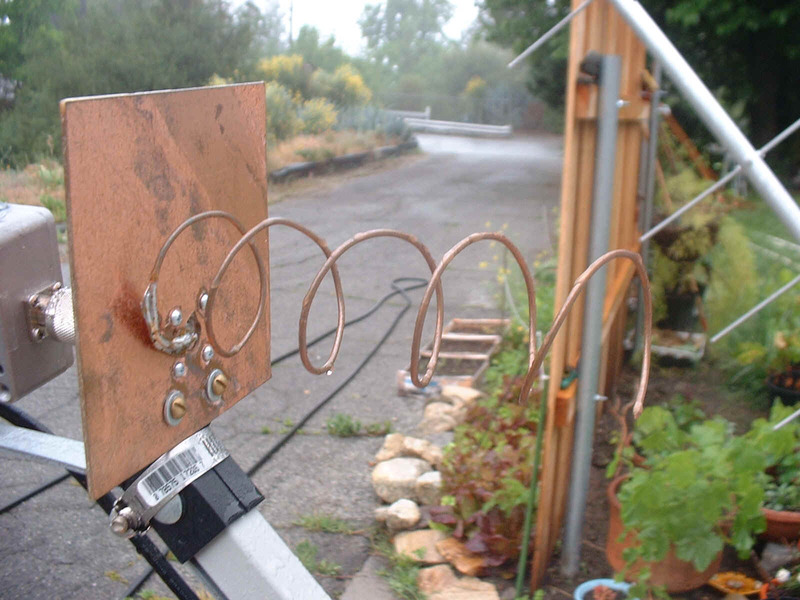 I intend to replace the linearly polarized yagi with a 18 element circularly polarized yagi I got cheap on E-Bay. This beam has more gain so I may be able to use my FT-100 barefoot to do the uplink. Circular polarization will reduce the fading signal reports I get when the satellite is low on the horizon and will clean up the SSTV pictures I'm sending. The hardest part of the station was the 2.4GHz downlink. The ARRL class gave me some leads on where to obtain the required equipment. I have no microwave experience, but between the class and the internet I was able to put together a workable station. The 2.4 GHz receiver was not difficult at all. Feedline losses are intolerable at 2.4 GHz so a device called a downconverter is frequently used. The downconverter is mounted at or near the antenna and converts the microwave signal to a lower frequency (IF). There are a large number of MMDS wireless cable TV downconverters on the market available at a low cost that are amenable for modification. A simple modification involving placing tape over a filter adapted the downconverter for the 2.401 GHz AO-40 frequency. I also changed the crystal inside to change the IF from 122 MHz to 144 MHz (this step is optional if you have a general coverage receiver). Photo of the Downconverter modification. You can see the tape between the center clips. A better downconverter option I've recently discovered is the model AIDC-3731 modified and sold by Bob Seydler K5GNA. Bob has replaced the filters in the downconverter with a Murata filter which improves the response and selectivity. The noise floor and gain of his modified downconverter is comparable with a "plug n play" downconverter from Down East Microwave or SSB Electronics at about a quarter of the cost. This downconverter works well without a preamp. They are available on E-Bay for a fixed price (search for K5GNA) or you can e-mail him direct at k5gna@aol.com. The hardest part of the downlink was the antenna. The satellite is as much as 60,000 KM (36,000M) away so the path loss is large and you need a lot of gain. It takes so long for the signal to go to the satellite and back that there is a one second plus delay in hearing yourself on the bird. I turn down the receive audio when I'm talking in a QSO so I don't go crazy. Every source I ran into came to the conclusion that a parabolic dish was necessary to achieve adequate gain to work the bird. Knowing nothing about dishes, I started off with a commercial "barbecue" grill dish with a dipole feed. I was able to hear the middle beacon of AO-40, but I could not decode the telemetry or hear any signals other than CW. My system gain was inadequate. The next thing I tried was a 2.4 GHz preamp from Downeast Microwave. The preamp helped somewhat. After inserting the preamp I could decode about half of the telemetry blocks and I could barely make out strong SSB signals. I was able to make a AO-40 contact (barely) who told me my uplink was strong, but I had to cut the contact short because I could not hear him decently. I needed a better antenna. Surfing the web I found a satellite TV supplier that was selling a new 76cm solid dish with an AZ-EL mount, but no feed for $50. 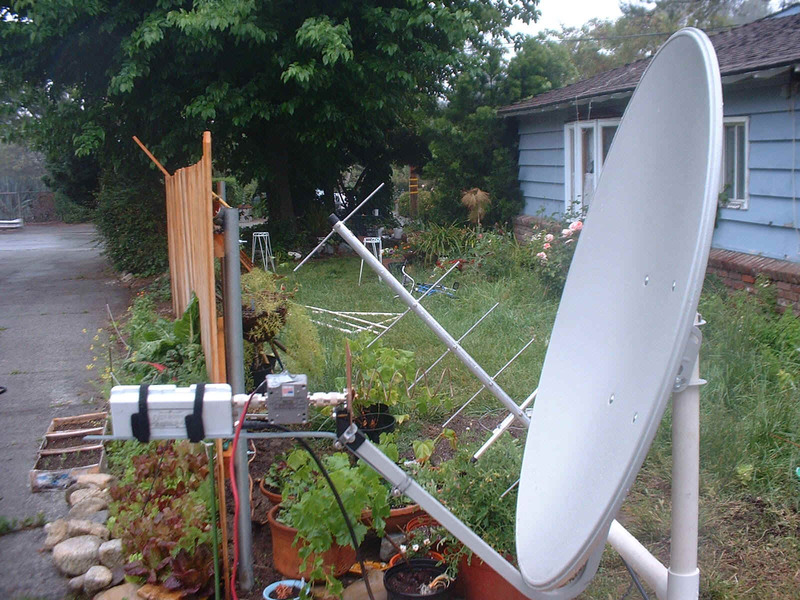 Go here if you want to see it Skynet Satellite 76cm $50 Dish. 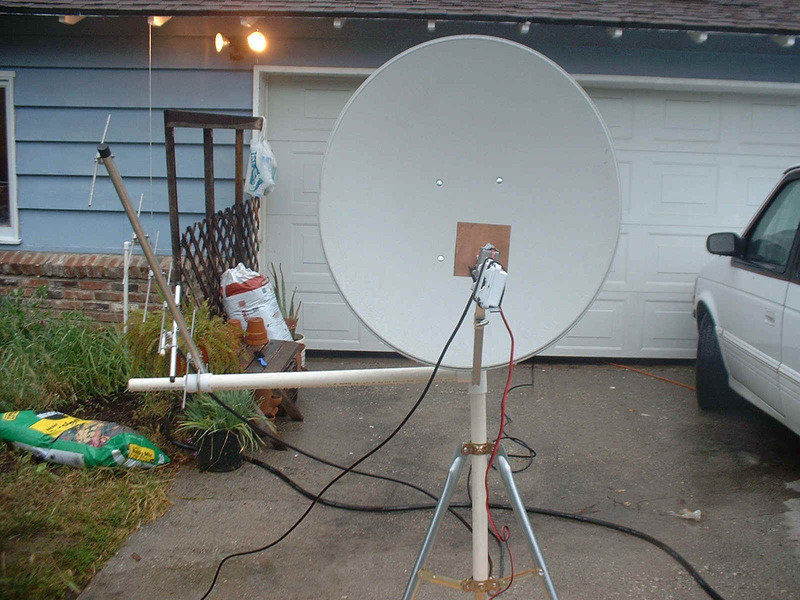 I bought the dish and designed a PVC mast for it and set it on a tripod. Next I needed a feed for the dish. I did not know where to start. The ARRL antenna handbook had very little useful information about parabolic dishes and wasn't much help. I stumbled into a great dish reference on the web. Paul Wade W1GHZ has written an online book about parabolic dishes that explains the theory and gives lots of practical tips W1GHZ Dish Book. Between it and a pictorial by K5OE I put together a simple helix feed that worked great. The improvement gained from the circular polarization and the larger solid dish was so great that I could make consistent contacts and copy the telemetry beacon with few errors. I was able to make the station portable and use it on Field Day 2002. We made seven contacts with AO-40 using our club call KG6JUD. 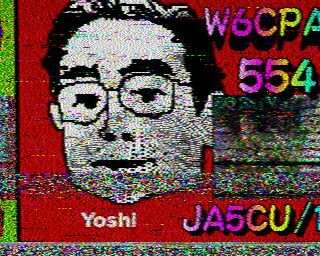 I recently made my first SSTV contact on AO-40 with JA5CU/1. My recent AO-40 SSTV experience has pointed out a couple of problems I have with the station. I can receive SSTV pictures on AO-40 that are crystal clear P5. When I first tried to transmit a picture I thought my uplink wasn't working as I could not see my own picture. After contacting JA5CU/1 I realized that I couldn't see my own picture because I am desensing my receiver. I am trying to build a notch filter for my input to solve this problem. I am also trying a new downconverter which supposedly has superior filtering to my existing downconverters. 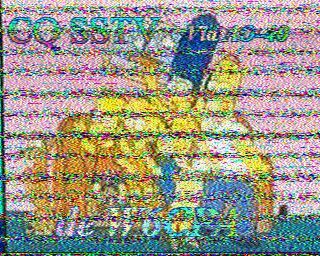 Another problem the SSTV operating has exposed is my uplink signal fade. I am using a linearly polarized antenna for my uplink and as the squint angle increases (the squint angle is the angle the satellite antenna is pointing away from earth) and the received signal strength drops, the spinning of the satellite is causing a noticeable fade. I have acquired a circularly polarized 70 cm 18 element yagi. I need to build a phasing line for it and that should solve my uplink fading problem and may allow me to dispense with the brick amp. I've been having a lot of fun on AO-40 and I plan to get on the LEO sats soon.